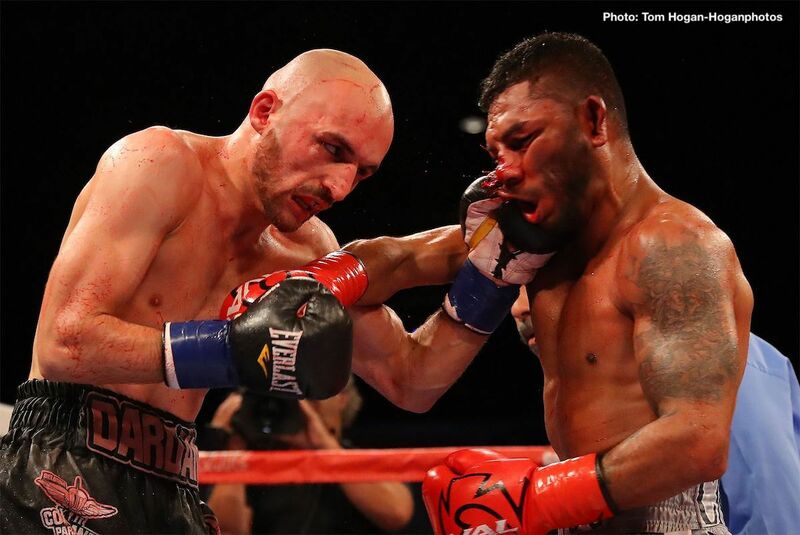 Super featherweight contender Andrew “El Chango” Cancio (19-4-2, 14 KOs) of Blythe, Calif. scored a 10-round unanimous decision win against hard-hitting contender Dardan Zenunaj (14-5, 11 KOs) of Pec, Kosovo in the main event of Aug. 17 edition of Golden Boy Boxing on ESPN at Fantasy Springs Resort Casino in Indio, Calif. Cancio won a hard-fought war with scores of 91-99, 91-99, and 96-94. Greg “The Villian” Vendetti (20-2-1, 12 KOs) of Stoneham, Mass. scored a hard-earned unanimous decision win against Yoshihiro “Corazon de Acero” Kamegai (27-5-2, 24 KOs) of Tokyo, Japan in tonight’s 10-round main event, which was heled in the stacked super welterweight division. Vendetti won with scores of 98-92, 98-92, and 97-93. Luis Feliciano (8-0, 5KOs) of Utuado, Puerto Rico defeated Jonathon Fortuna (8-2, 5KOs) of Santo Domingo, Dominican Republic via fifth-round TKO with a series of vicious body shots in a fight originally scheduled for eight rounds in the welterweight division. The fight ended at 2:38 of the previously mentioned round. Anthony Reyes (3-0, 2KOs) of Coachella, Calif. scored a unanimous decision win against Luis Montellano (0-3-1) of Tijuana, Mexico in a four-round super bantamweight battle. Reyes won the fight with a score of 40-36 from all three judges. Shakhram Giyasov (4-0, 3 KOs) of Bukhara, Uzbekistan scored a knockout victory against experienced veteran Albert Mensah (31-7-1, 15 KOs) of Accra, Ghana in a fight originally scheduled for eight rounds in the welterweight division. The fight was stopped at 1:56 of the third round. Rommel Cabellero (2-0-1, 1 KO) of Coachella, Calif. scored a first-round body-shot knockout win against Jahaziel Vazquez (2-8, 1 KO) of Saltillo, Mexico in a bout scheduled for six-rounds in the 130-pound division. Cancio vs. Zenunaj was a 10-round super featherweight fight presented by Golden Boy Promotions. The event was sponsored by Tecate, “THE OFFICIAL BEER OF BOXING” and Hennessy, “Never Stop, Never Settle.” The fights took place on Friday, Aug. 17, 2018 at Fantasy Springs Resort Casino in Indio, Calif. Previous boxing news: RESULTS: Jose Antonio Rivera – KO winner in his first fight in 7 years!